There are many variations of ingredients that can be used when preparing the uniquely shaped cottage loaf. It can be made as a whole wheat bread or a combination of whole grain flours can be used. The following instructions are for a cottage loaf prepared with white flour. 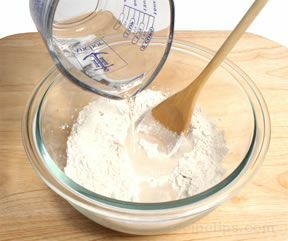 Begin by blending 2 teaspoons of active dry yeast into a half cup of warm water (95º to 115ºF). Allow it to sit for 5 or 6 minutes or until the yeast begins to bubble and foam. Fresh cake yeast can also be used, but use only one-half ounce. In a large bowl, combine 3½ cups bread flour or all-purpose flour and 1½ teaspoons of salt. 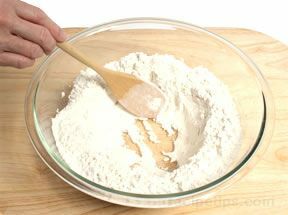 After mixing, create a well in the center of the dry ingredients. Pour the yeast mixture into the center of the well. Slowly stir the liquid, picking up some of the flour from the inside walls of the well. Continue drawing in flour until a paste forms. Then add water in small increments and continue drawing in the flour. No more than one cup of water should be necessary, but add small quantities of water to the dough if it is still too dry. 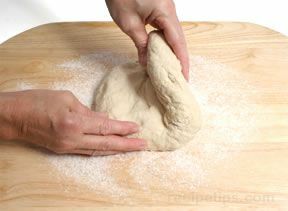 Place the dough onto a floured work surface and begin the kneading process by folding the dough in half. 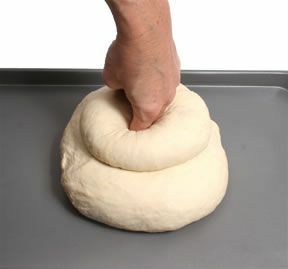 Using the heel of your hand, press firmly on the dough while pushing the dough away from you. Excessive force is not necessary because the dough will gradually become easier to work the longer it is kneaded, which warms and stretches the gluten. 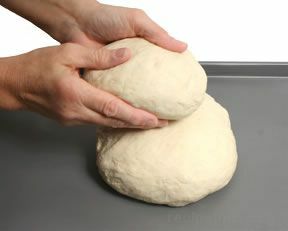 Fold the dough back towards you and repeat the kneading process. 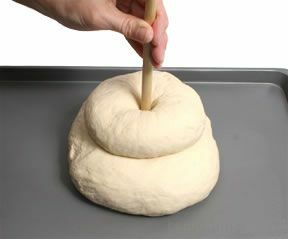 Turn the dough a little each time as you continue to knead it. 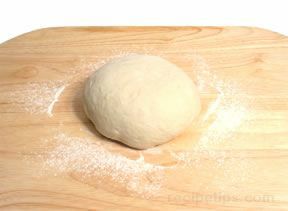 If the dough is sticky, sprinkle it with a small quantity of flour during the kneading process. A pastry scraper can be used to remove any pieces of dough that may stick to the work surface while kneading. 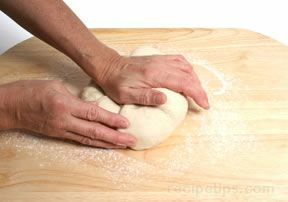 Continue kneading until the dough is smooth and elastic, which usually occurs in about 10 minutes. 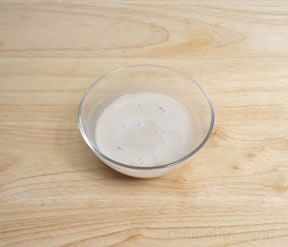 Place the dough into a lightly oiled bowl, cover it with a damp kitchen towel or an oiled plastic wrap, and allow it to rest for 2 hours or until the dough has doubled in size. 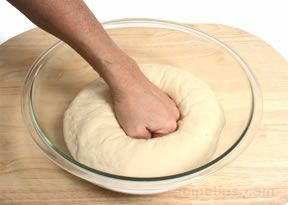 Punch down the dough and allow it to rest for 5 to 10 minutes. 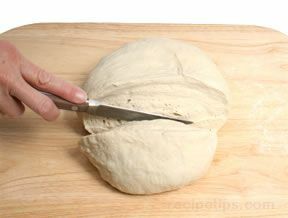 Divide the dough into two pieces with one piece being twice the size of the other. 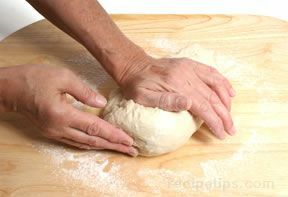 Shape the two pieces of dough into rounds. Place the larger round onto a lightly greased baking sheet and then place the smaller round on top of the larger one. Use two fingers to create a hole through the center of the top round and continue through the bottom round. A wooden dowel or handle of a wooden spoon also work well to create the hole. The hole welds the dough of the two rounds because some of the dough of the top round is pushed into the bottom round. 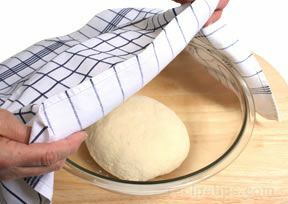 Cover the dough with a kitchen towel and allow the dough to proof until it is double in size, which should require 30 to 45 minutes. Bake in a preheated, 425ºF oven for 40 to 45 minutes. Check the bread for doneness by tapping on the bottom: A hollow sound indicates that the bread is done, while a dull sound indicates an underdone loaf. 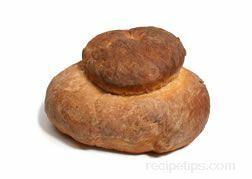 Remove the bread from the loaf pan or baking sheet and cool on a wire rack to prevent the bottom from becoming soggy.